NBC, the shadow puppet and pantomime show discount emporium, needed a way to make some money since only seven Community fans now watch the network. What did they do? 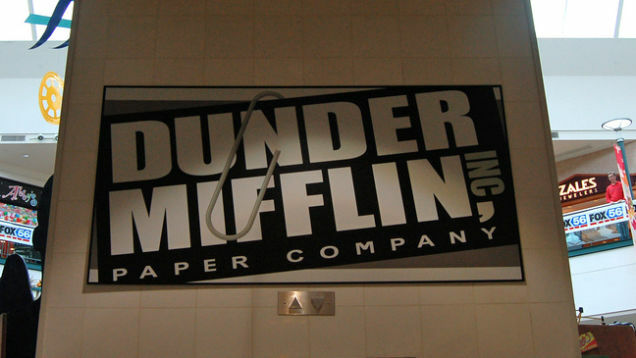 They went and sold their fake paper company, Dunder Miflin, to Staples. This sounds like a plot from The Office. Staples website Quill.com, which has nothing to do with DeclarationOfIndependence.com, will be launching a Dunder Mifflin brand of copy paper, so the copy room of your office will feel even more like The Office. This is the most recent stunt of "reverse product placement" where things like Kwik-E-Mart and Bubba Gump's Shrimp Company come out of the movies and into real life. Yeah, I'd love to ride Back to the Future's hovering skateboard or Crazy Stupid Love's Ryan Gosling, but some things are best left in the funny pages. Anyway, NBC will get 6% of the profits from the paper, which means they'll be able to afford Christina Aguillera's sequin budget for the next season of The Voice. Phew.